Sometimes on the internet, I happen to meet cool guys. However, this time was exceptional. Last month, I got a short message like this. My brother and I had a company that built an iOS app similar (in functionality at least) to your app. We haven’t had much traction and are planning on pulling it from the App store. 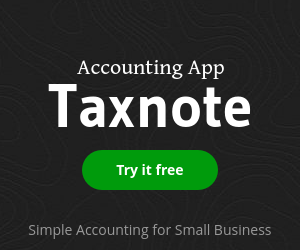 I’ve used your app, and it’s quite good. That being said, I have put together some assets (media kit and video) that might be of use to you (just picture your app in the video instead of ours). Let me know if this is something you’d be interested in and I could look at re-purposing the video and ‘story treatment’ for you. I also plan to update our site (reedeo.com) to re-direct people to your app. 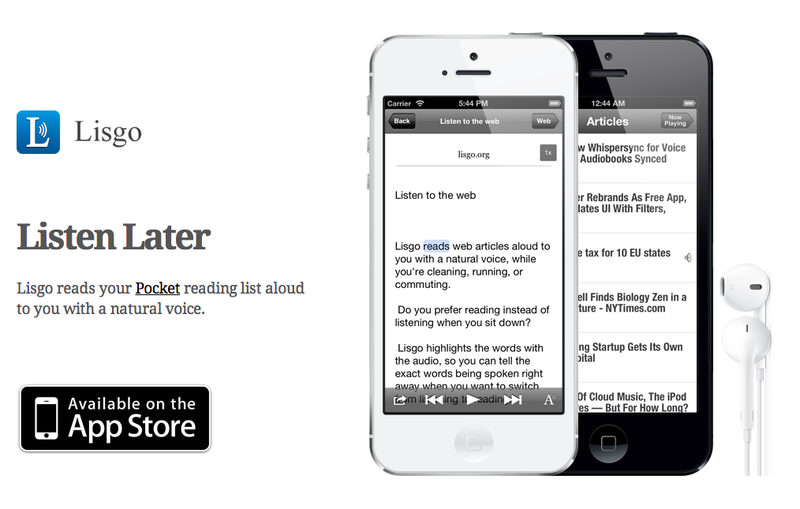 My app Lisgo is a listen later app for Pocket users, and their app’s concept is same. Honestly speaking, since there are many text to speech apps now, I didn’t know reedeo until he sent me the message, but I could easily tell they made a really nice promo video to explain the benefits of the app. This is the original video for reedeo. When I made Lisgo, it was really tough to explain the concept of the app, since most people said “I’d rather read articles, since it’s faster”. I knew it would be nice to make a promo video for that, but I didn’t do that since it would take a lot of time and efforts. I replied with thank you very much message, and I sent the free promo code for Lisgo. Even though their app has a very similar concept, I know it still takes a lot of time to edit the movie for Lisgo, I couldn’t believe his kindness at the time. Several days later, I got a message from him again. I finished making the updates to the video, I hope you like it and can use it; here is the link to it on Vimeo. Best of luck with Lisgo. And, this is the video he made for Lisgo. You can tell he didn’t just change some parts of the original video, but added extra scenes to explain the some best parts of Lisgo here. It’s awesome. I was so impressed with his geniality, so I thought I should update Lisgo’s landing page at least to use this nice promo video efficiently. It didn’t take so much time since I could use some codes of voicepaper page. 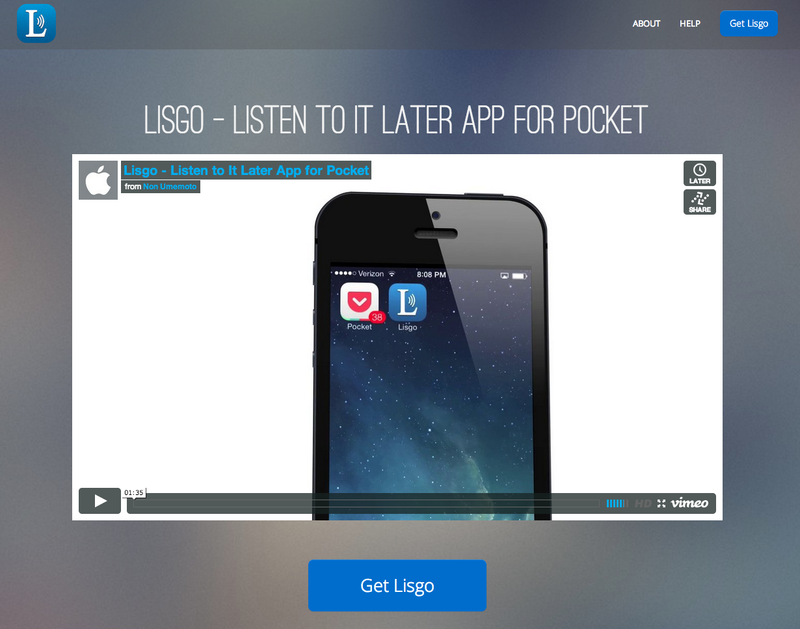 This is the previous Lisgo landing page. 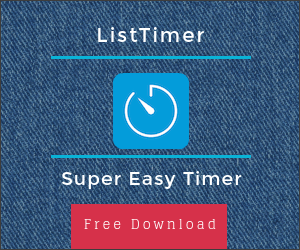 This is the new landing page look for http://lisgo.org/. The video must stand out compared to the previous one. Again, thank you David and your friends for taking your times to make the video.